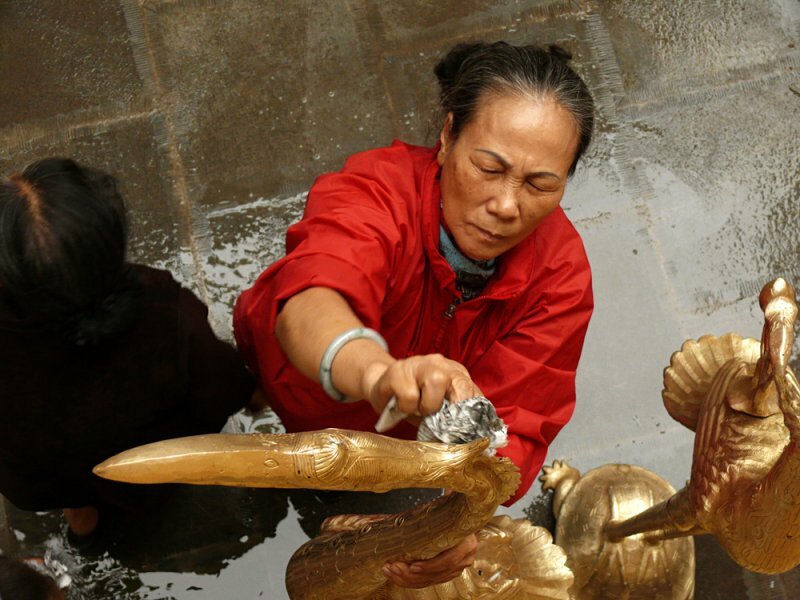 Early morning finds crews of temple volunteers polishing the ceremonial brass figures that adorn Hanoi's Ambassador Pagoda. I stood on a balcony overhead and shot straight down on a woman who was looking up at her work. The most effective way to photograph any person at work is head on, rather than from the side. Side vantage points are always passive instead of active, and invite confusing mergers in the background. If a person is looking down at their work, the photographer should get down and shoot up, even if it means getting on the floor. And if the person is looking up at their work, it is best to seek a higher vantage point, as I do here, and shoot down on it. Glad this example is useful to you, Khang -- you live in Hanoi, and can take advantage of the balcony at this pagoda for working shots, too. What a lesson I had here for shooting working people, thks a lot Phil! Thanks, Vera, for seeing the energy behind those closed eyes. I am glad they kindle your imagination. I hope that this image will help you grasp the importance of vantage point: where you choose to stand will often determine what your picture has to say. I never in a million years would have thought of this. There are no distractions in this photo. We are left to see her face and imagine. Perhaps she is imagining being in another place and time with her eyes closed so tightly. If I close my eyes, this will all go away. her great care. These golden figures are sacred, and her touch is reverently applied. She may look like her eyes are closed, but the water on the ground around her is testimony to her hard work and her concentration on her task. The gleaming gold against the dull gray background is proof of her commitment. If a perspective causes the viewer to do a double take, stop, and study an image, Carol, it is doing its job. And in this case, my high vantage point pulls the viewer into the job at hand. Your perspective is indeed a bit perplexing which only adds to the fascination of this image. Glad this image is useful, Veraferia -- I always welcome your comments and questions.